Easter is almost here and I am soooo excited for this long weekend we get to have here in the UK. I feel like I've been working way too much so it's nice to be able to finally let my hair down but most importantly go a bit wild and wear nice bright nail colours. Speaking of nails, today I want to bring 2 things in one post. 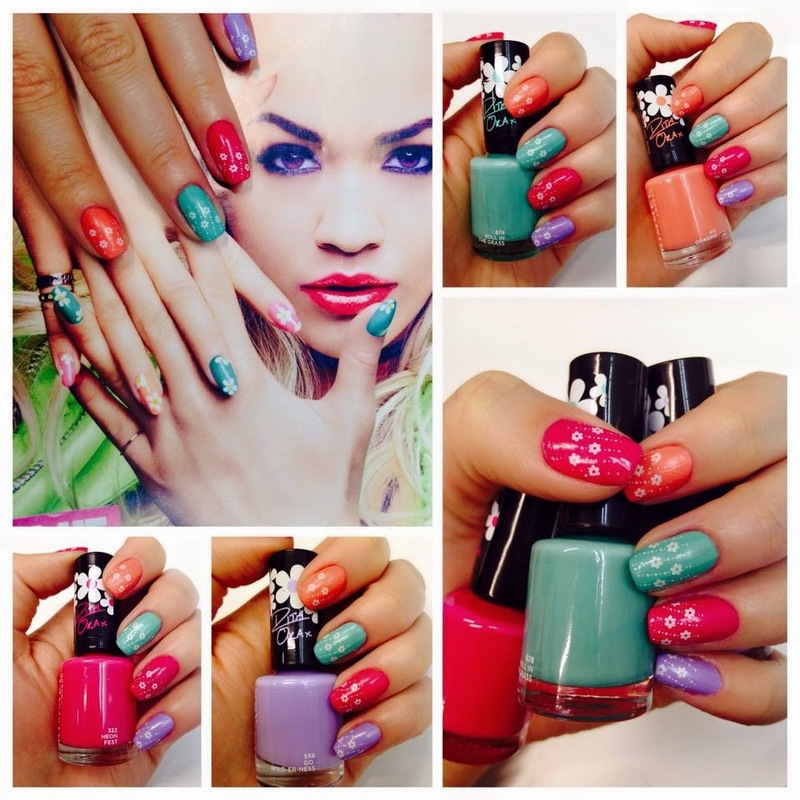 I want to share my opinion on the New Rimmel London 60 Seconds Super Shine by Rita Ora polish collection and show you a fun way of wearing them for an Easter themed manicure. 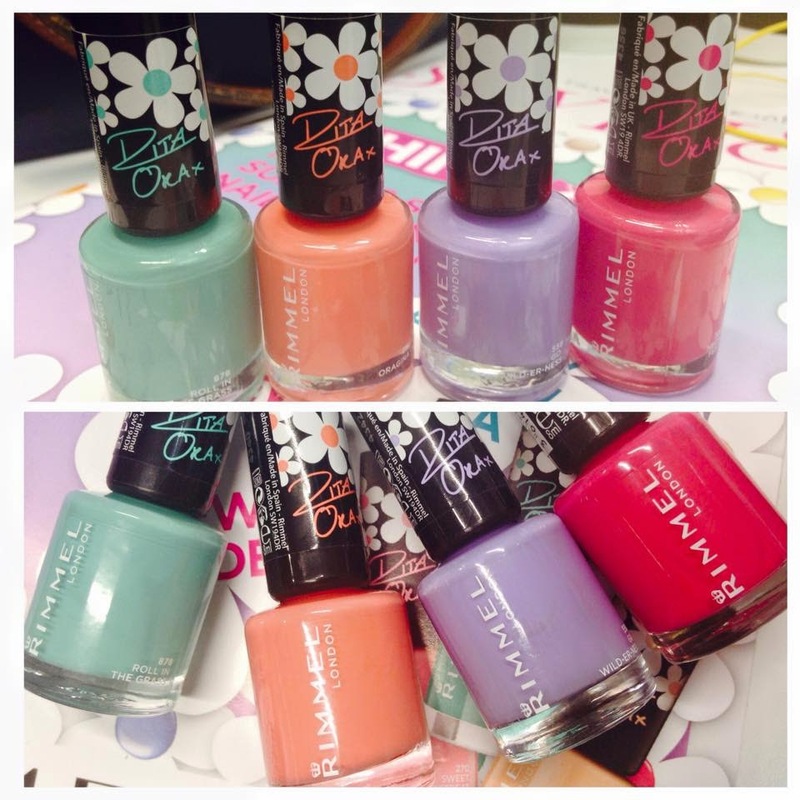 Picture: Rimmel London. You can see all the colours available here. It’s not a secret to anyone that I have been faithful to Essie polishes (and Essie polishes only) for a very long time. But as soon as I saw the cover page of Stylist magazine for this week I knew I had to have them. The colours available are absolutely gorgeous and you will find yourself wanting to buy the whole range! Roll in the Grass 878: green, green, green! This is the only green colour in the collection and they have done it perfectly! The colour you see on the bottle is what you will get on your nails, and to me that is exactly what I wanted for my Easter nails. Orangina 413: a cross between peach and orange. It’s darker than Peachella and lighter than Tangerine Tent from the same collection but still a perfect orange for this spring. Go Wild Er Ness 558: a pastel lilac and in my opinion a perfect dupe for Essie Lilacism. It’s all about pastel colours nowadays and this does not fail to disappoint. It does need 2 coats to give your nails a good coverage, but it dries in no time so that shouldn't be an issue. Neon Fest 322: My absolute favourite! I personally love bright cheerful colours and this is the perfect magenta pink! I find that this can be worn with only one coat and still look great. Now, here is a swatch for all the colours mentioned above. My Easter Nails! I love how fun and colourful they look. I did ask my mum if I could do her nails too but she kindly rejected the offer saying it was a bit too much for her age (I will take that as a compliment mummy). I saw this super easy design on the back cover of Stylist and tried to recreate my own version and I think it’s quite good for someone who has zero nail art skills. If I can do it, so can you! For the white flowers, I used the Konad Stamping Nail Art set and Stamping Plate M69. Thanks for reading once again everyone, leave a comment to tell me what you think! Ooooo I haven't seen these yet :0 they look amazing ! !